Waaaaaaaayyyy back in February, or maybe it was even January, Heather sent me some photos of quilts she was working on. I immediately texted her and asked if I could please test some of them!!! By the next day, I had copies of several of the patterns. I started with Petals on a String. Please go over to Heather’s blog, Anka’s Treasures, and take a look at her photos. They are so much better! I got a big surprise earlier this week when I was cruising though Instagram. My quilt is on the cover of her new book, Angles With Ease 2. I also tested Radiant. I absolutely love this quilt!!! The fabric is Moxi, a new line from Moda. My plan with this one is to put an applique border on it with some bold flowers. I can’t ever just leave something alone! I also pieced another quilt for her that I forgot to photograph, so I’ll save that for another post. Heather’s book, Angle’s with Ease 2, will be available soon. I love every quilt in the book. You’re going to want it! And now I’m going to go outside and enjoy the sunshine. It’s that sunshine that made the first quilt very hard to photograph! Categories: Uncategorized | Tags: Anka's Treasures, Quilting | Permalink. So, We Have This Puppy…..
Our new puppy Lola is adorable. She’s smart. She listens well. But she’s still a puppy. She went potty on this quilt soon after I took the photo. I yelled at her. Anyway, I’ve been spending a lot of time in my sewing room because I can keep her contained there. Needless to say, I’m getting a LOT of quilting done. I have enough stuff to write several blog posts. I’m just not doing it. I finished the quilt that Lola is sleeping on. I will have to photograph it soon! I’m working on two moron projects that deserve their own posts. And I started two BOMs. I’ll blog those next week when I work on the next month. I’ve been wanting to change my quilting style for a long time. I’ve always bought a fat quarter bundle of a line of fabric and made a quilt with it. The photo above was done that way. I want to start making scrap quilts. It probably means I’m going to have to take apart my fat quarter bundles and sort them by color. This quilt was designed by Edyta Sitar of Laundry Basket Quilts. I love her quilts. She does scrappy projects with lots of little pieces. I started with a line of fabric, Nell’s Flower Shop, an old line from Moda. I’ve added a whole bunch of fabrics to it, and I like it so far. I’m feeling so brave!!! There are 444 blocks in the quilt. If I decide to be a moron and do the quilt king size, I’d have to do 1,188 blocks. I have one block done. These little blocks finish at 2 inches. I’m planning to make the smaller quilt and if I’m not sick of it, I’ll go for the king size. I have all the strips cut and sewn for the four patches. It’s a start! We’re doing a quilt retreat next week, so I’ll have lots of time to sew. And now I have a puppy that needs to go outside. After that, I think I’ll go sew four patches while she plays. Categories: Uncategorized | Tags: APQ quiltalong, Edyta Sitar, goldendoodle, Laundry Basket Quilts, Quilting | Permalink. Whew! We survived Christmas. I could tell you all about the parties, food, and all the stuff we did over Christmas, but my brain is fried! We ate a lot. We had fun with family. We got on each others nerves. We opened presents. We laughed a lot. Mostly at Frankie. And now we’re all chilling. The boys have been ice fishing. The girls are just hanging out. The Genius and I are on a crafting binge. I finished a bunch of mug rugs, and got several of them ready to go out in the mail today. I saw a photo on pinterest and decided I needed to make one or ten. I cut one strip of white fabric and ended up with 10 squares, so that’s how many I made. So scientific of me, huh? I made a stop at Pier 1 before Christmas to find snowman mugs. You’ll have to excuse my late night photography. This is one of those projects that I’m really pleased with, but they were kind of a pain. They’re six inches square, and binding the silly things took forever! Anyway, I actually executed a plan, and finished them! It seems like it usually takes me about 3 years to finish a Christmas project. The Genius has taken on a HUGE project for me. She converted my big loom to a new system and this is her test project. Yes, she is a moron. It’s her 4th weaving project ever, and it’s on a different loom. I’m proud to say she inherited the moron gene from her mother!!! I’ll tell you more about this project soon! I’ve done very little knitting, as I seem to be back in a quilting mood. The Genius has also done very little knitting, as she’s found out that playing X-box with her little brother is more fun. And now that it’s 1:30 AM, I should head to bed. I’m sitting here listening to a bear snoring in the next room. I think I’ll wander around the house and find an empty bed somewhere. Categories: Uncategorized | Tags: Glimakra, mug rug, Quilting, snowman, weaving | Permalink. All Crafting! All the Time! I’ve been a bit craft crazed lately. Maybe that’s why when I did laundry last weekend, the piles resembled mountains! It had been a while. I want to knit everything, spin everything and quilt everything. I’m even finishing some quilts. 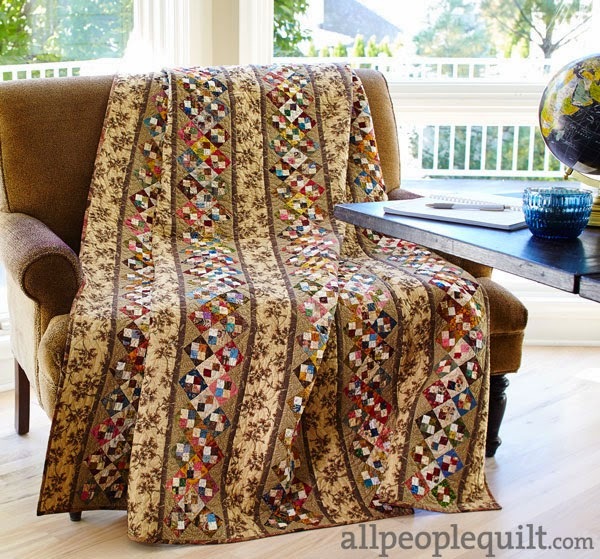 In July of 2011, I had the brilliant idea to make all of the quilts in the Living Large 2 book. I blogged my idea here. So, a bit more than three years later, I think I only have one quilt in the book that I haven’t made. I finished the largest one last week. The pattern is called Starlit Evening and Heather blogged about it here. I had all of the blocks made and stashed in a container. I pulled them out and arranged everything on the floor. To be honest, I wasn’t feeling the love. Then I started putting it together. By the time I was finished, I was totally in love! And so was my sidekick. This pattern is genius and it’s strip pieced! The fabric line is Strawberry Fields by Fig Tree Quilts for Moda. I’m pretty sure I bought backing for this project. I just need to find it. I highly recommend all the patterns in this book. Heather is a genius! If you’d like to purchase the pattern, you can find it here. I’m also back to painting furniture. I bought a sofa table for $50 on a swap and sell. I wish I’d taken a photo of it before I killed it made it beautiful. First I sanded it. Then I stenciled on the top of the table and the shelf on the bottom with cream paint. After that was dry, I went over it with a dark stain. How cool is that? Then I primed the rest of the table. Although the gray primer actually looks kind of cool, that wasn’t the look I was going for. Here’s the finished project. Yes, the garage is a scary place! I really really love how this turned out. I brushed a bit of stain over the red and distressed it a bit. Then I rubbed a couple of coats of Minwax on it. Mission accomplished! My idea for the project came from this post. What a great idea! And what am I up to this week, you ask? I’m finally learning how to weave. I’m pretty sure my brain is about to explode. I had no idea how involved it is. Ask me on Friday if I want to add weaving to my plethora of crafty endeavors! Now I’m going to go rest my brain to get ready for another day of weaving instruction. Categories: Uncategorized | Tags: Anka's Treasures, furniture painting, Quilting, stenciling, weaving | Permalink.